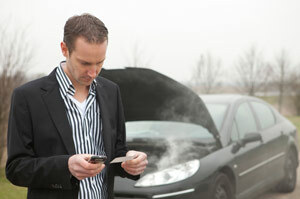 You hit a massive pothole, smoke starts billowing from your engine, or your car simply breaks down. Its almost inevitable: at some point you will experience trouble with your vehicle. However, if you’re prepared, have the right supplies, exercise caution and know when to call for help or towing, your car trouble will be but a tiny bump in the road. If you’re experiencing problems while driving, attempt to get to the right-hand shoulder of the road, especially if youre on a highway. As a rule of thumb, try and keep the following safety procedures in mind as you pull off the road. You may simply have run out of gas. If your engine hesitates before turning off, you could be low on fuel. If that’s the cause of your vehicle breakdown, call for help. You may have a dead battery. An easy way to check for an electrical problem is by turning on the headlights or turn signals. You may be dealing with a more complicated problem. If your fuel is good and your lights work, it may be time to call a tow truck and have the problem examined by a mechanic. Use your emergency blinkers if its daylight to alert oncoming traffic to the fact that your vehicle isnt moving. Its not a good idea at night because motorists coming up behind you may think that your vehicle is still rolling along the highway and run right into the rear end of your car. In unfamiliar, out-of-the-way areas, stay with the car as long as possible and lock your doors. If someone strange looking approaches, use your car horn to its full potential. High-traffic areas are usually patrolled by police fairly regularly, so you should be able to get help relatively quickly if you should need it. Having roadside assistance coverage can be invaluable when you break down; you should always keep the numbers for your assistance program handy in your car. The inconvenience and frustration of car problems can be annoying to say the least, but remember don’t panic and most importantly make safety one of your top priorities. If you are stopped on the side of the road because of a car accident that wasn’t your fault contact one of our Tulsa car accident lawyers today for a free consultation.